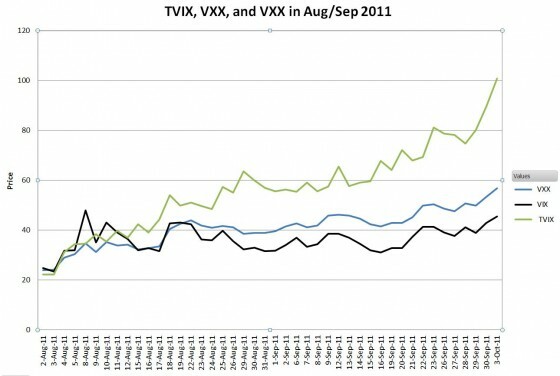 From August 2nd to October 3rd, 2011 Barclays’ S&P 500 VIX Short Term Futures ETN (VXX) had a great 137% runup. In that same period VelocityShares’ TVIX ETN, 2X leveraged on the same index went up an astonishing 348%, 73 percent more than its 2X leverage factor would project. How is that possible? Don’t inverse and leveraged funds always underperform the index they’re tracking? Normal market price action is typically random, with the number of up and down days about equal. This bouncing back and forth is really bad for inverse and leveraged funds. A classic example is a two day sequence of 10% up one day followed by a 9.091% move down. The non-leveraged fund ends up unchanged. But all the daily rebalanced -1X, 2X and 3X leveraged funds suffer. For more on rebalancing see Under the hood of a leveraged ETF. 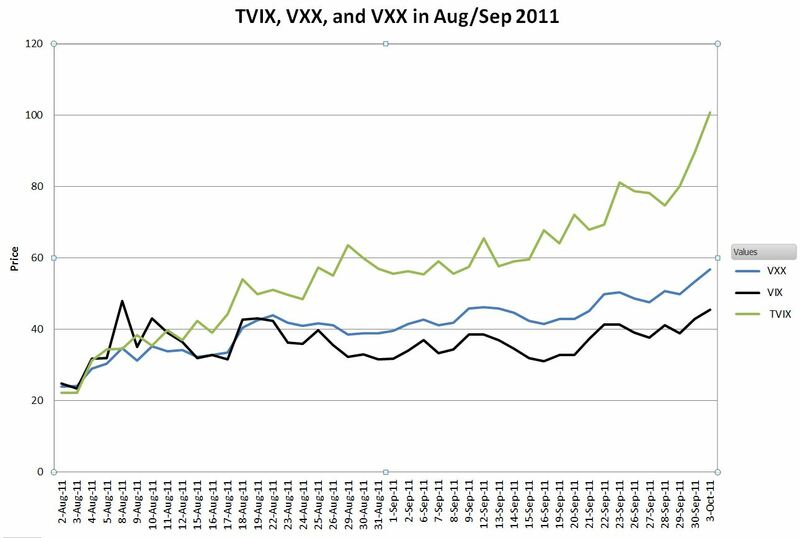 There wasn’t much back and forth for TVIX in the Aug/Sept 2011 timeframe. When carried out for 44 days the projected excess gain for TVIX given a constant +2% daily change in VXX gives a theoretical excess of 288%. The actual excess gain was “only” 73% because VXX did have a few down days along the way. The increases in VXX were steady, without a lot of random motion—resulting in a positive compounding effect. These three conditions are relatively rare, happening roughly once every two years. The decrease in volatility is steady, without a lot of randomness—resulting in a positive compounding effect. These conditions were satisfied from mid-June to mid-October in 2012, and the performance of inverse volatility funds was impressive. 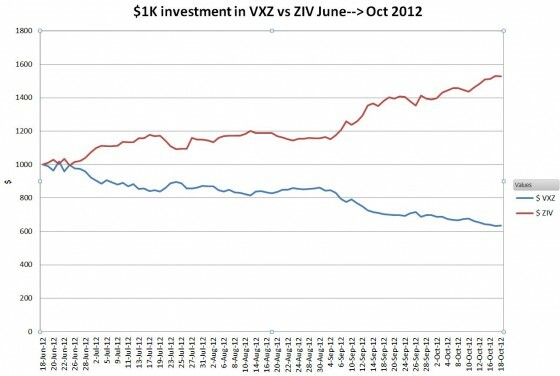 The chart below shows $1K invested in Barclays’ medium term volatility product VXZ, and ZIV, VelocityShares’ -1X daily reset medium term volatility ETN. 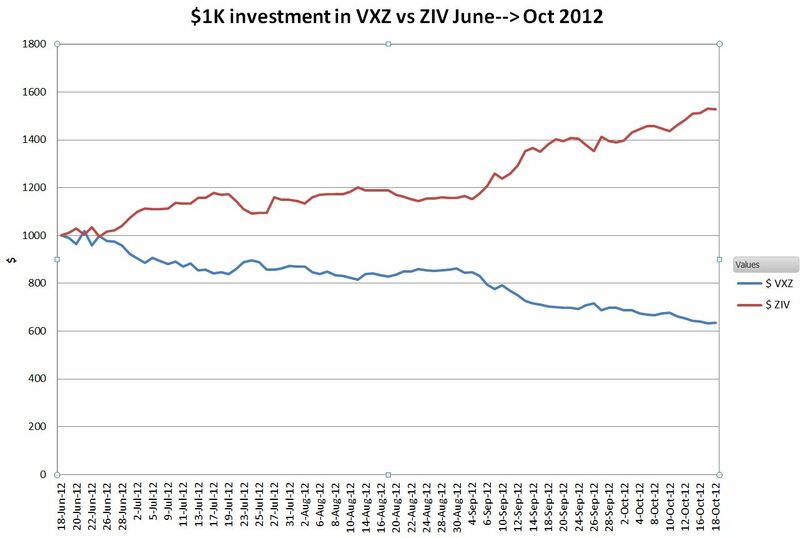 VXZ went down 36.4% during this 3 month period, ZIV was up 52.7%. This hat trick on inverse volatility paid off nicely.